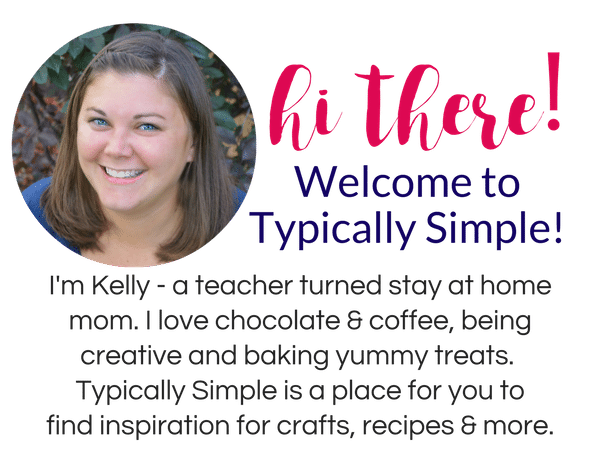 While I have nothing against crafting with paper bags, popsicle sticks, and glue…lots and lots of glue, there comes a time when moms need to have a craft project or two that is just for them! No one arguing over who gets the blue marker or that complaining that someone is giving them a dirty look. Just a group of moms, crafting time, and a glass of wine! 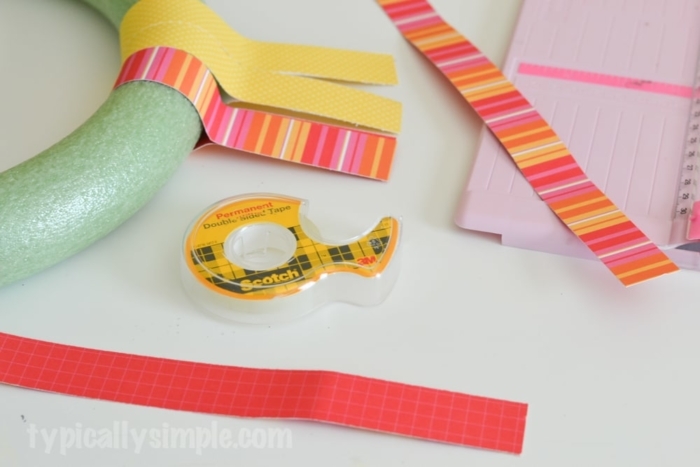 With so many fun Pinterest night projects, you need a hot glue gun. I have such a love-hate relationship with my hot glue gun. The burns, the drips, those darn stringy things that get all over everything. But I don’t know what I would do without it for a few of my projects. However, when you have a group of moms sitting around a table crafting, the last thing you want are cords all over the place and dripping hot glue while you are trying to relax and enjoy a craft night. 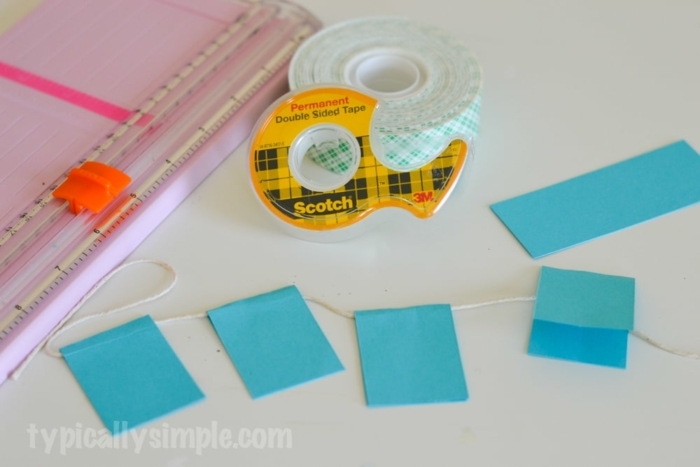 So I introduce to you….Scotch® Brand Permanent Mounting Tape and Scotch® Brand Double Sided Tape. 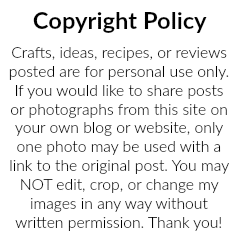 This entire project was made using these two items – super easy to use, no mess, and my project did not fall apart and become a Pinterest-Fail! 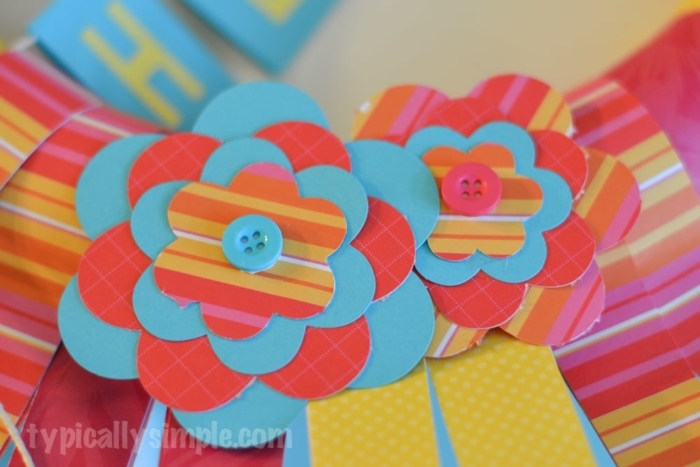 So let’s get down to business on making this Scrapbook Paper Wreath! You can do all of your shopping for your supplies, including Scotch® Brand and Command™ products, in the crafting aisle at your local Walmart. 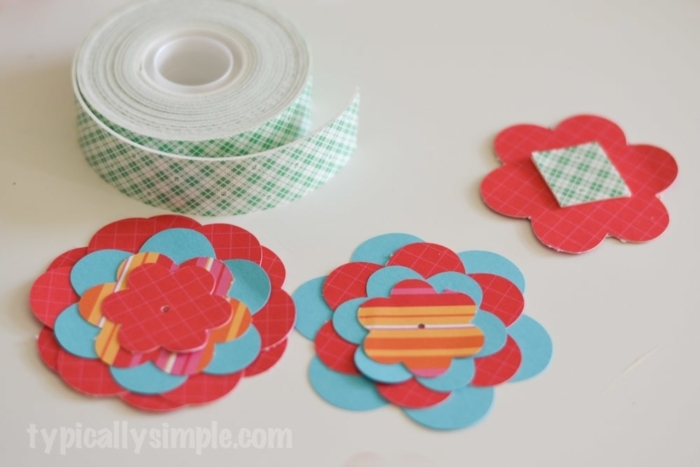 You’ll want to get started by cutting your scrapbook paper into strips. I made mine an inch wide and used 3 sheets of paper to fill out my wreath. But feel free to experiment with different widths! Run a piece of Scotch® Brand Double Sided Tape on the back of a paper strip, wrap it around the wreath form and press the ends together. Continue this process until the whole wreath is filled. Sometimes the paper slides a little and this is where the Scotch® Brand Permanent Mounting Tape comes in handy! 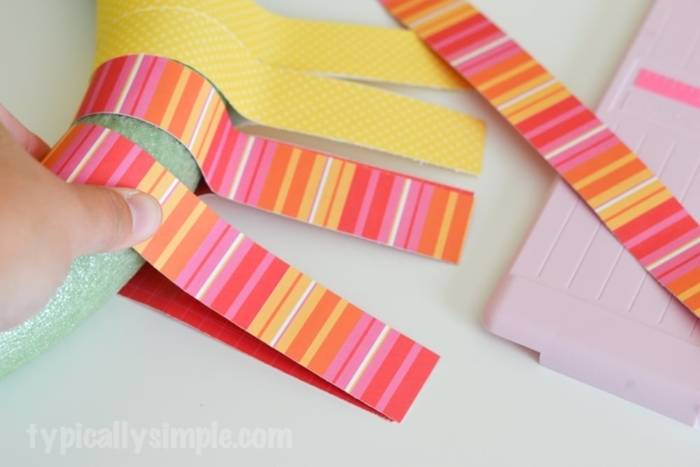 Add a piece here and there to keep those paper strips in place. 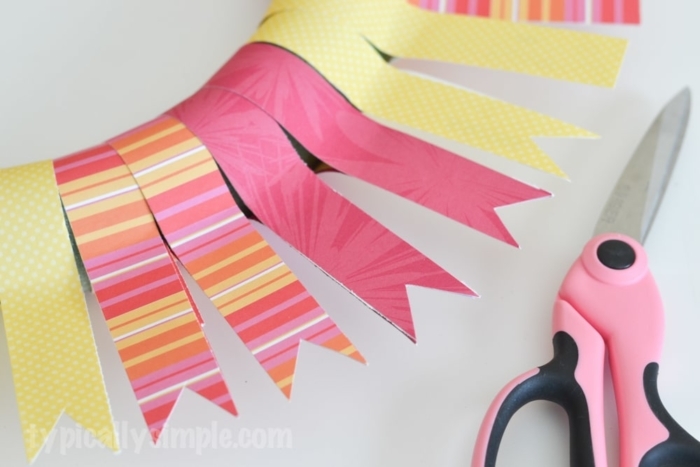 After your wreath is filled, use some scissors to cut a notch in each paper strip. Now for some creativity! 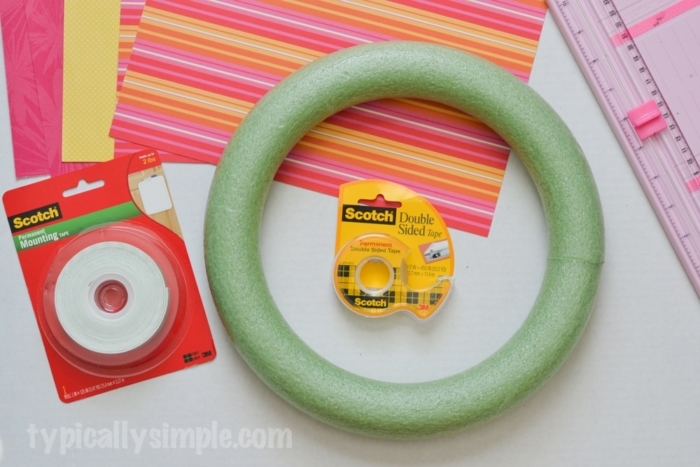 Using the Scotch® Brand Permanent Mounting Tape, add embellishments to your wreath. I added a little hello banner and some paper flowers. And I really love the strong holding power of the Scotch® Brand Permanent Mounting Tape…I don’t have to worry about anything falling off the wreath in a few days. I even used it to add some buttons to my flower embellishments! 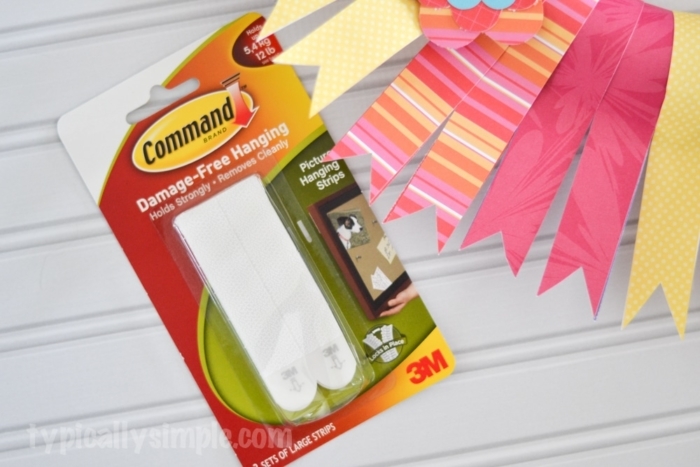 And something I swear by for hanging up my wreaths in our house are Command™ Picture Hanging strips. I use them for everything! Especially because their products hold on strongly, come off cleanly. I don’t have to worry about it pulling off paint or the finish on a door when hanging up my craft projects and pictures. 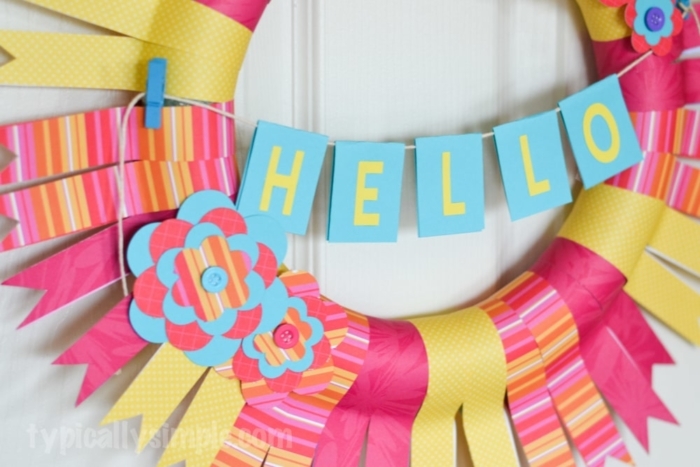 This scrapbook paper wreath is perfect as a fun mom’s night out for anytime of the year! Using different colors and prints of scrapbook paper, it can be made for any holiday or season. Plus you don’t have to wait for anything to dry since you are using Scotch® Brand products! Looking for more wreath ideas? 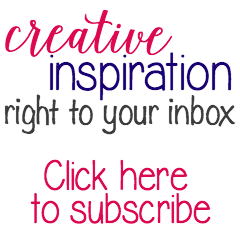 Check out these other easy to make projects!